Are you ready for a delicious Thanksgiving dessert? 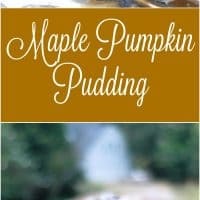 Get ready for Maple Pumpkin Pudding! As the last fleeting days of summer roll past, I anticipate the fall with great delight. We were fortunate this year that summer was not too ridiculously hot here. Even so, I look forward to a couple of months of open windows, of an extra blanket on the bed to snuggle beneath, of hot tea and spiced cider. And of pumpkin. Fall is the only season in which I can make a dessert the color of the leaves around me. Some of you may know that I have only come to appreciate pumpkin desserts over the past few years. Most of the pumpkin pies I had ever tried seemed bland and muddy, and a bit rubbery. My new and enduring rule for most pumpkin recipes I find these days is simple and effective: half the spices, double the salt. The roasted flesh of pumpkins has a sweet and delicate earthiness that begs to be enhanced with spices, not overshadowed by them. And, lest we forget, pumpkin is a gourd that passes for a vegetable, and it needs to be salted to so the flavor sings. 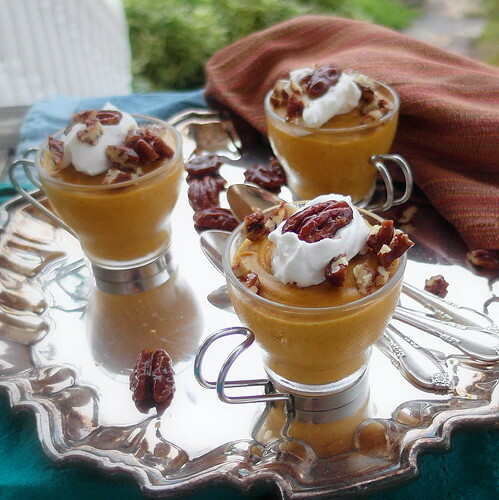 This pumpkin pudding makes use of some heirloom pumpkin puree that I made and froze last year. Rather than sweetening with the expected granulated or brown sugar, I chose to use maple syrup, allowing one sweet earthy note to reinforce another. 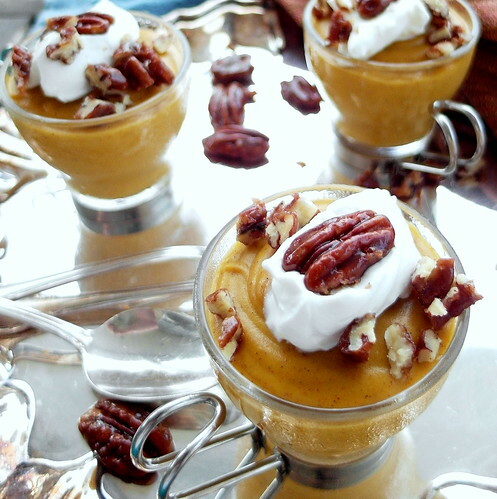 You can choose to serve this pudding as is, or for textural contrast, candy some pecans or some pepitas in maple syrup, salt and a bit of spice. 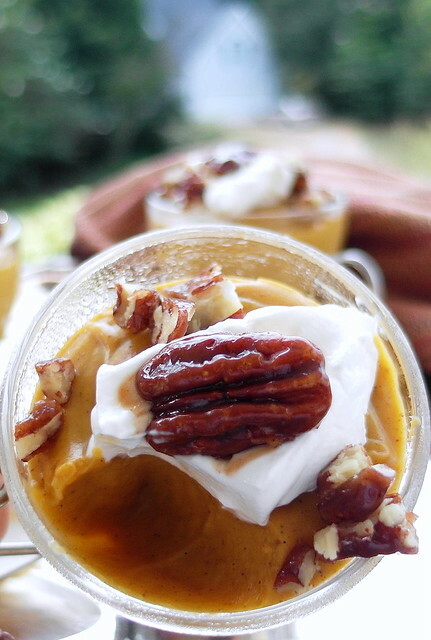 This would also work nicely as filling for individual pumpkin tartlets. I made you a long pin so it’s easy for you to save. See? 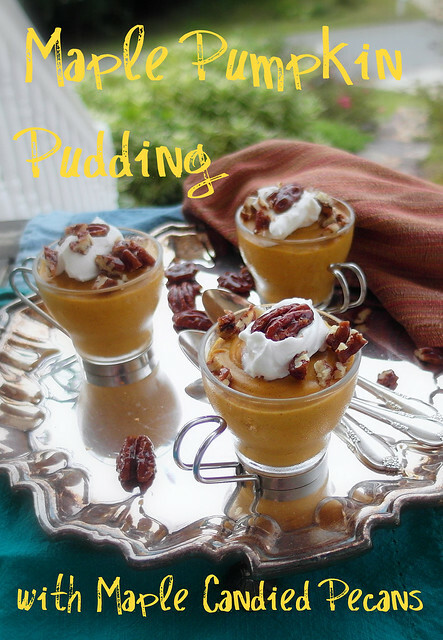 This pudding is very easy to make, and it comes together quickly. I hope you enjoy it as much as we have. Feel free to double the recipe if you'd like to feed more people or if you just want larger portions. As is, this recipe yields 4- 1/2 cup servings. Put the maple syrup, butter, salt and spice/s in a heavy-bottomed skillet. Heat over medium heat until the butter is melted. Add the nuts, stirring to coat. Let the nuts cook in the syrup until the syrup hardens into a candy when you spread a bit on a Silpat. This will take about 5-7 minutes of almost constant stirring. Spread the nuts in a single layer on Silpat to cool (you can also use a lightly oiled cookie sheet). Once cool, chop some and leave some whole. You'll have more than you need for garnishing the pudding, so you'll have some for snacking. Put the lemon juice, vanilla, optional maple extract and butter in a medium bowl. Set a fine metal strainer over the bowl, and keep convenient to the stove. In a medium saucepan, whisk together the milk, pumpkin puree, cornstarch/flour, yolks, salt, maple syrup and spices. Let boil about 30-45 seconds, until uniformly thick and no longer foamy. Pour into the strainer, scraping the pan well. Press the pudding through the strainer to catch any egg bits or errant strings from the pumpkin. Stir well to combine the pudding with the butter and flavorings. Pour into individual serving cups or pre-baked mini tart shells. Let cool and then refrigerate until cold, about 1 1/2 hours. Dollop on some plain yogurt, sour cream or creme fraiche. I used sour cream and didn't even bother to sweeten it. It went really well with the pudding. Garnish with the chopped and/or whole nuts. Thank you so much for spending some time here today. Enjoy the pudding, and happy pre-Fall! LOVE it!! I also love that you teach about baking and tell people why you add certain things! Really makes sense! Thanks Jenni you rock! 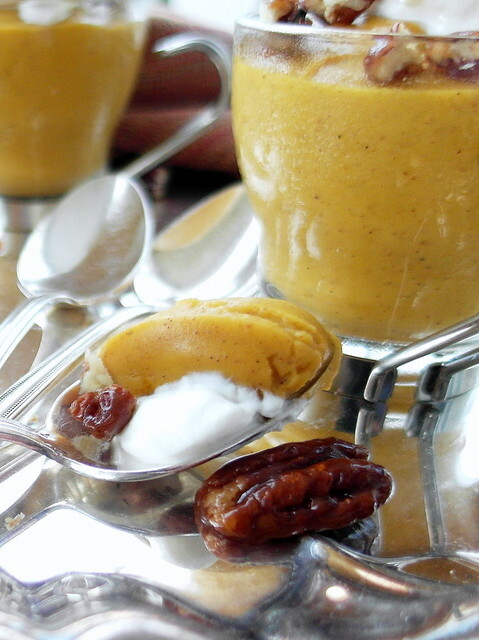 It’s so funny to think that your love of pumpkin came about just recently because your Maple Pumpkin Pudding looks like it was developed by a life long pumpkin lover. 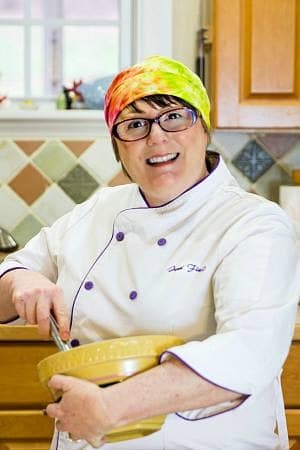 Then again, that may be another one of the fabulous things about you, Jenni…your ability to acquire a new taste for something and turn that into a gorgeous and delicious dish that belie the years it took to develop.